So, this book is split in to two sections. The first is a lengthy proposed system for social interaction with NPCs and "Agents" (essentially important NPCs that are reoccurring and should be treated as three dimensional characters). 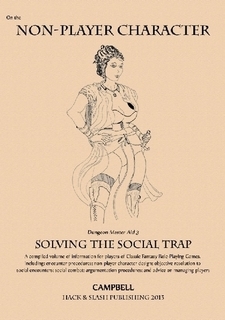 The second, is a series of charts and tables for developing NPCs. Let's start with the beginning. A lot of Campbell's philosophy is soaked in here, which may irritate some people, but I like how upfront he is about it. One thing that stuck out to me was his insistence that NPCs only need be defined by how they relate to the players, and things like motivation and depth are meaningless. This will rile some people. To be honest, it riled me at first. But the more I thought about it, the more I realized that this explained (at least in part) my own frustrations with NPC interaction. By positioning NPCs not by how they relate to the world, but how they relate to the players, you come away with much more interesting encounters. Campbell's system is built on 2d6 reaction charts for monster and NPCs. It does a nice job of making reaction rolls a little more interesting. From there, players can make social moves. These include such things as "Honor", "Insult", and "Bluff." Essentially anything you can think of would fit into one of the many categories. Each has different modifiers, targets, and results that modify how NPCs think of you. I like this. But it's a little complicated. Too complicated for my rules-light sensibilities to pass on without some thought. Social encounters should be smooth and conversational, and adding too many rules takes away from that. That said, I plan on using a large part of this in my next campaign. I just plan on simplifying some of the actions, and winging it a little more. What i love about Campbell's system is it creates a nice bell curve of reactions, and builds on that with a framework that describes how things break down from there. He also provides a nice handy cheat card in the back that helps immensely with most of the rules. In the end, the system won't collapse if you decide to throw half of it out and just use what you like. The second part of the book is my favorite, and this is where Campbell outdid himself. His tables list 400 phytiscal traits, 400 personality traits, and 400 personal (quirk) traits, and I can't really fault many of the entries. He also includes combat commentary charts, monster activity charts, and more. If you are the type that has a hard time making up NPCs on the fly, this will help you. I know it will help me. Nothing to see here folks. Not much at least. The cover sets the tone, minimalist to the max. But that's not why you got this book anyway. This may sound odd, but I think this book would be better without any interior art. I just wanna get to the tables man. *Edit. Okay, I gotta admit. I absolutely love one of the art pieces. Page 2 has a piece that embodies old school style art. Can't fault that in the slightest. Nice high quality stapled book. At almost 60 pages, the book was pushing it for stapled, but it felt sturdy and stiff. This is a workhorse book. Not too pretty, but tough and functional. I think the PDF would be just fine for most use, but for the $5 price difference, why not get a hard copy? Anyone who wants to spice up their NPCs on the go or wants to add depth to social encounters. If you like hyper-usable random charts, this is for you. If you seek to simplify your games at all cost, this probably isn't for you. Anyone who thinks social interaction in role playing is just talking things out. Story gamers of any kind will probably run away screaming after a few pages. Thank you so much for the review brother! Glad to get the word out for such good content. I will get around to your newer stuff sometime, I promise.